Cracks, curls, cups, and stains call for a new roofing project. 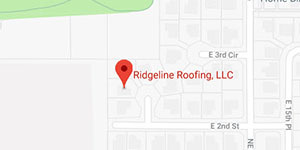 At Ridgeline Roofing, we see the roof as the crown jewel to your house’s curb appeal. To get a full return on your investment, consider giving your home a roof with a long and beautiful life. After all, a deteriorating or damaged roof will only reduce the future return. When is the right time to replace your roof? Luckily, you don’t have to wait for the storm of the century to pass, and a roof doesn’t have to collapse before reaching the end of its life. Here are some warning signs to let you know that a new project needs to be scheduled with Ridgeline Roofing. If your roof is as old as your first-born college graduate, it may be time to replace those trusty shingles. A typical, well ventilated roof lasts up to a quarter century. However, if your roof is showing other signs of deterioration well before that two-decade mark, consider updating your home. Granules are tiny, about the size of sand, but serve an enormous function on a roof. Granules fuse into a fiberglass or asphalt shingle and protect the bottom layer from UV rays and the elements. They also give a roof its flare and aesthetic appeal. Granule loss can manifest like exposed asphalt patches of a roof top, or appear in the downspout of a gutter. Granules can be loosened by walking on shingles, but are most likely lost at when an old roof is reaching the end of its life. If shingles start curling at the edge, chances are the sunlight is warping the shape and functionality of your shingles. Inspect the south-facing slopes of your roof, and other parts of your roof that get a lot of sunlight. Curling is a sign of an aging or defective roof, which could lead to other problems like cracking or loss of granules. If you see your shingles curling at the edges, contact a contractor. Being made of a malleable material like tar, shingles over time tend to warp into cups. They discolor and form a concave center, where the corners of the shingle curl upward. This is normal wear and tear, and a clear indication that your roof is getting old. When cupping is visible, roofs are risky to walk on. It’s a sign that the shingles are aged and therefore fragile, and could crumble easily under your feet. Walking on cupped shingles will also cause irreparable damage to the roof, so be ready to replace or repair your roof at the sight of them. Cracking and splitting happens to fiberglass asphalt shingles for the same reasons it happens on asphalt roads. 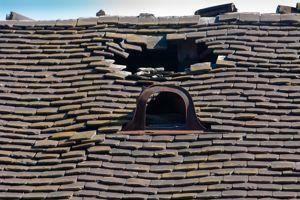 Cracking happens especially when shingles are installed during winter months. When the weather takes its seasonal course into summer, the changes in temperature can cause expansion and subsequent splitting. Shingles tend to split vertically or horizontally. Usually this is caused when old shingles become brittle in the sunlight. 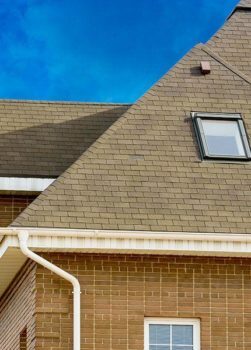 Shingle tabs can go missing over time after enduring seasons of heavy weather, especially in a storm where winds exceed 60 miles per hour. After any storm, homeowners should walk around their premises and inspect their roofs to make sure every shingle is intact. One particular area to check if roofing tiles are missing is the valleys that run to the gutter. Roof valleys are essential to your roof. They allow rain and snow to flow freely down the roof into gutters rather than pool into one place. Over time, however, the shingles covering these valleys can deteriorate, losing granules. Sometimes mistaken for mildew or mold, algae stains appear on northern-facing sides of the roof, as well as well-shaded roof slopes. Airborne algae, which grow in humid climates, appear as a greenish-black stain shaped like water running downward toward the rain gutter. Algae stains reduce roofing life by eating away at the shingles, which also causes granule loss. The unsightly stains also reduce the curb appeal of your home. That’s why if you live in a humid climate, consider investing in a shingle with copper or biocides. Similar to algae stains, moss also tends to grow on the north sides of a home as it would on a tree in a deciduous forest. Moss prefer damp, cloudy and cold environments to grow under the corners and flaps of shingles. If it’s a small amount of moss, the green spots can be raked or power-washed off of the roof. However, if you ignore the problem, too much moss can eventually cause damage and an unsightly appearance, shortening the lifespan of your roof. As with algae, moss can also be prevented by using shingles with copper and zinc to resist any growth. Sometimes trees and their debris can cause unsightly black or brown stains on your roof. That’s because organic debris like fallen branches and leaves hold moisture on the roof surface. When the leaves or petals from a cherry tree are left on a roof to decompose, they can leave behind black and brown stains. That’s why it’s important to regularly sweep off roof debris, especially roofs that are at a low angle and have protrusions, like skylights. Are you noticing a trend among your neighbors? Perhaps at the last HOA meeting, they agreed to re-roof their homes. This may be a sign that you need to do the same. Plus, being the only house on the block with an out-dated and shoddy roof could make you stick out like a sore thumb. On the other hand, start a trend by being the first to replace your roof. It’s important to be aware of the age of your roof when considering hiring a roofing contractor. It’s also crucial to inspect your roof for wear and tear every season. Taking into account the climate’s affect on your home, along with the proximity of trees that may cause debris, you can be more prepared for a new roofing project that will turn the heads of your neighbors and increase the value of your home later on down the road.